The title says 2 guns well I give this more then two. This movie made more money then the smurfs 2 well I can say thank god. The movie has some funny parts and the main two guns in this movie are good. It was funny, suspenseful, and dramatic. I'll never wash my belly-button the same way again! 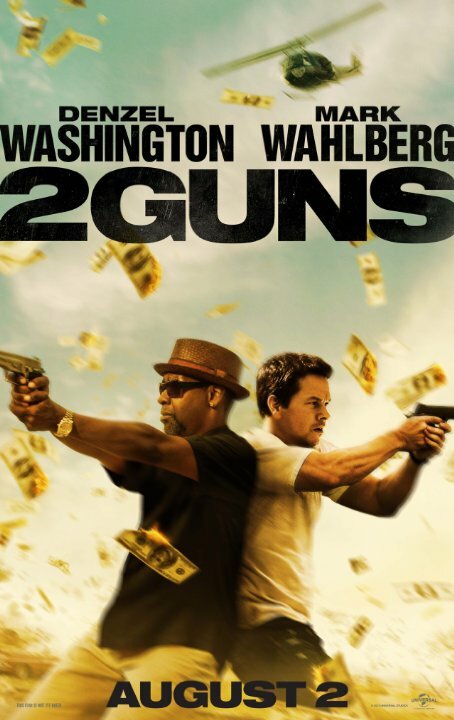 2 Guns: the generic action movie you've been waiting for. The way the film is structured is really obvious. They were going for the generic action movie formula, but added a lot of plot twists in it, so it would seem smart. No, it was just confusing who was good or bad, and that set the characters a step back. What upsets me is that the only guys that are putting any work into the movie are Denzel and Marky Mark. Their chemistry is excellent, because they are two top-billed actors who know how to make it work, even when they have to juggle back and forth this recycled dialogue. Bill Paxton… When I exited the movie, I remembered: Oh yeah, Bill Paxton was in this movie. That's how forgettable he is. The success or failure of a film with two big names depends on how well those stars mesh. If it's a romantic movie, the man and the woman have to have chemistry. If it's an action movie (like 2 Guns) there still has to be that chemistry in order for it to succeed. Lucky for us, Denzel Washington and Mark Wahlberg are completely in their element and they play off each other so well that it makes for interesting, exciting adventure. No posts have been made on this movie yet. Be the first to start talking about 2 Guns!